The July-September 2016 issue of ARMOR, the Professional Bulletin of the Armor Branch has been posted online. Of particular interest to those interested in historic AFV development will be the article by Jim Warford titled “Armored Vehicle Development Behind the Curtain: the Secret Life of the Soviet SU-122-54 Assault Gun.” The title of the article is pretty self-explanatory, it examines the history of the Soviet SU-122-54 Assault Gun, a weapon system that received little attention in the West during the Cold War. The new issue of ARMOR can be downloaded here. In September 1967, the Soviet military launched Exercise Dnepr, one of the largest exercises in Soviet military history. Most observers and military analysts focused both on the size of the exercise and the large-scale use of airborne forces. The Soviet army actually dropped two complete airborne divisions with all their equipment in support of a front-level offensive during the exercise. Almost unnoticed, however, the Soviet army also deployed a previously unseen new assault gun. This new assault gun, known as the SU-122-54 (to distinguish it from the SU-122 Self-Propelled Howitzer of World War II fame), has been the subject of controversy since this first appearance. Throughout its lifetime, the SU-122-54 has been surrounded by a very high level of secrecy (even by Soviet standards), and it is a good example of the amount of effort the Soviets (and more recently the Russians), have historically put into keeping their most secret weapons developments secret. Over the years, this effort has proven to be especially true regarding Soviet antitank weapons. The Moscow Times is reporting that Alexander Zhuikov, who studies in Novosibirsk, has spent the last month building a solid 20-ton version of a SU-122-54 tank. The tank, which is colored khaki-green, comes with a gun barrel, turret and caterpillar tracks. 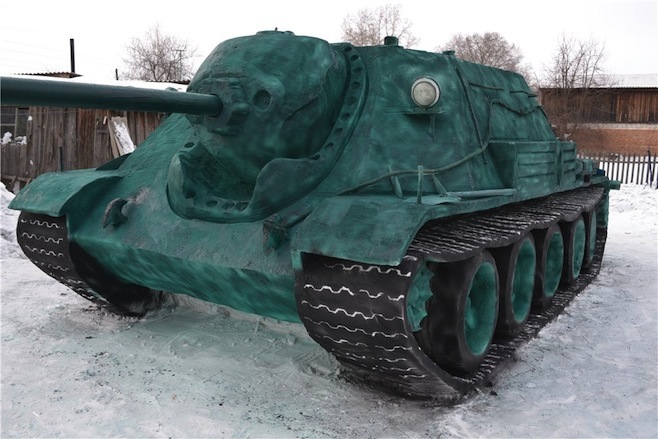 It stands at a height of 2 meters and measures 6 meters long, excluding the gun barrel, which is made out of cardboard, Roughly 20 tons of snow was needed to build the tank. Zhuikov built the tank in order to take part in a competition called “Tank in Ambush,” which is run by the producers of a popular computer game called World of Tanks. For pictures and full article, click here.